Already have online registration services? 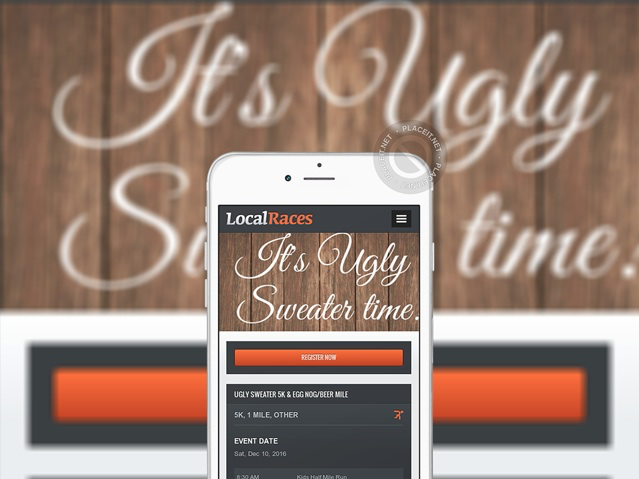 Advertise your event on LocalRaces here. 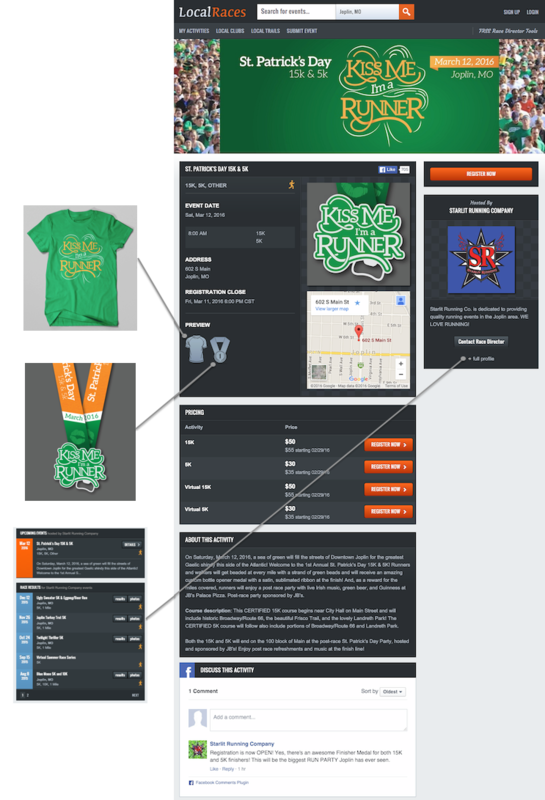 Effortless content management, customized cover image, logo, event details, social links, and preview images for shirts and medals. 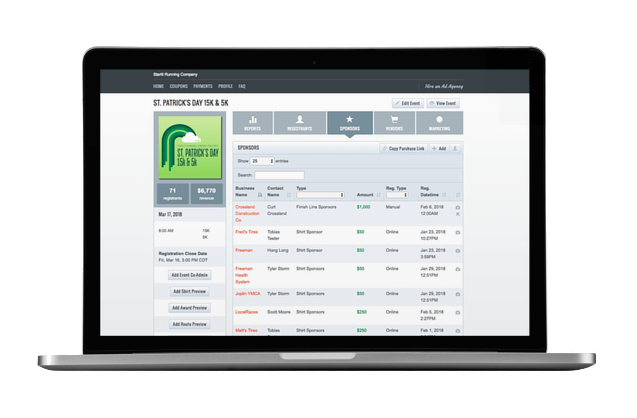 And automatically link to results and photos on race day. Optimized for search engines and responsively designed for mobile devices. 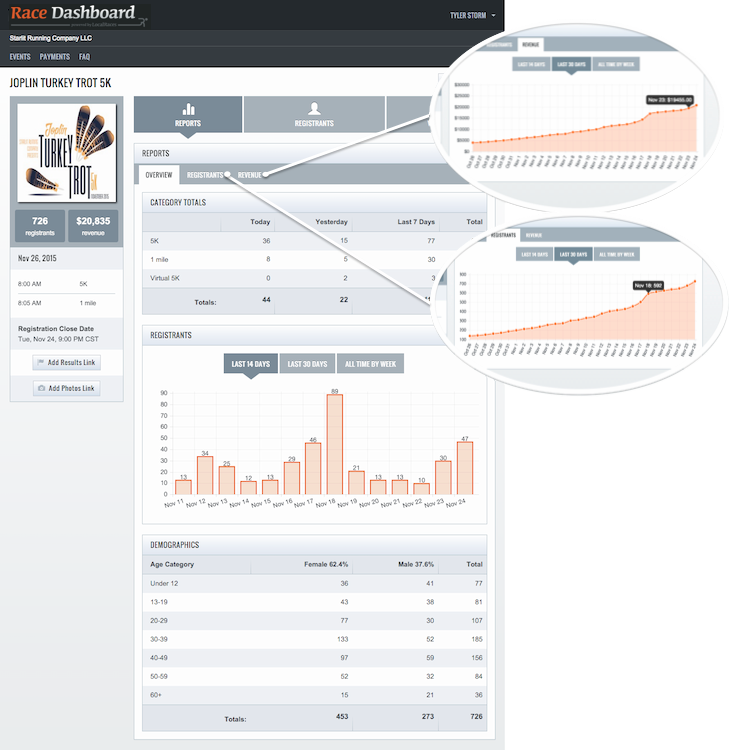 Built-in marketing campaign conversion tracking and analytics. Social network integration, including Facebook and Twitter. The “Host” webpage links to your organization’s upcoming events and past events’ results and photos. For a single registrant, a team, or a whole family. Fewer clicks and pages means higher conversions. And remember, 50% of your registrants will come from mobile phones! 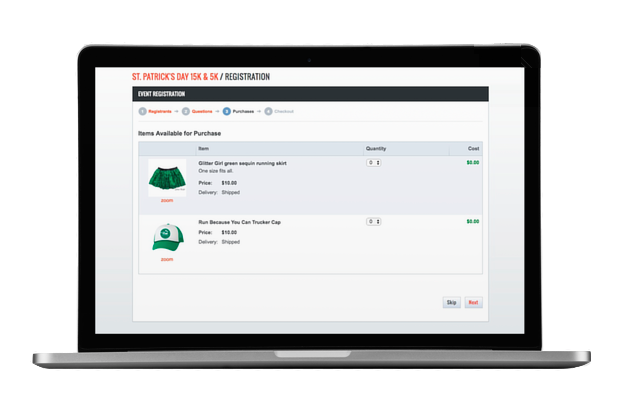 Built-in e-commerce allows you to sell additional items to registrants during checkout. 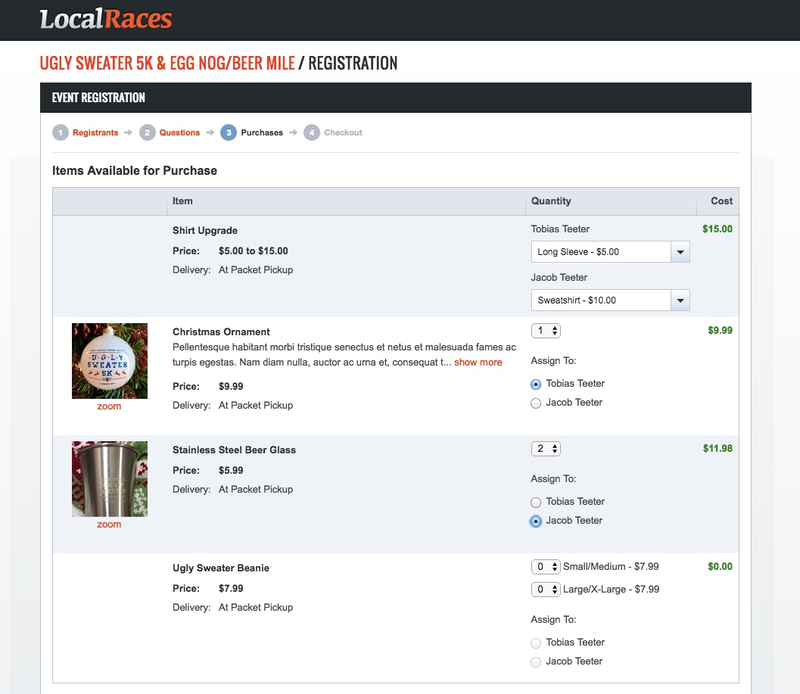 An event “store” preview panel displays items available for purchase on your event page. Collecting and processing donations from registrants has never been easier. 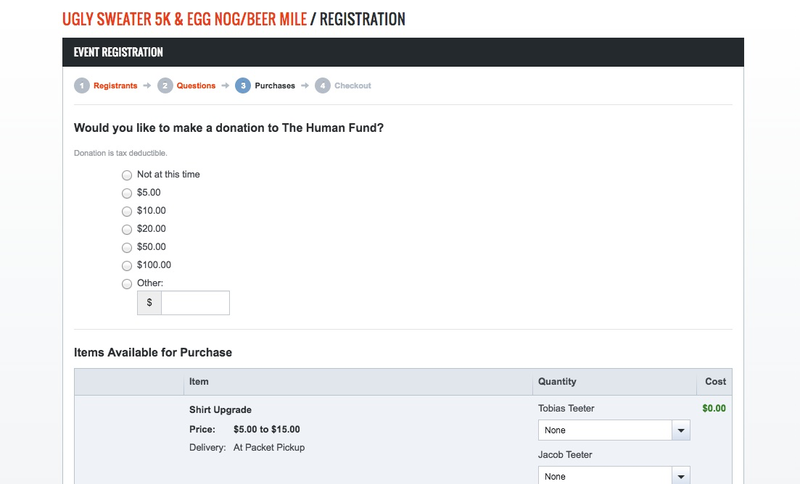 Add a donation ask during the checkout process to raise more money from your event registrants and allow supporters who can’t participate to still contribute to your cause. Set up is instant, so you can accept Visa, MasterCard and American Express the same day the event is created. Flexible processing fee options; you can choose to pass the fee to registrants or include it in the event registration fee. Receive revenues fast electronically twice per week. Paper check payment option is also available. 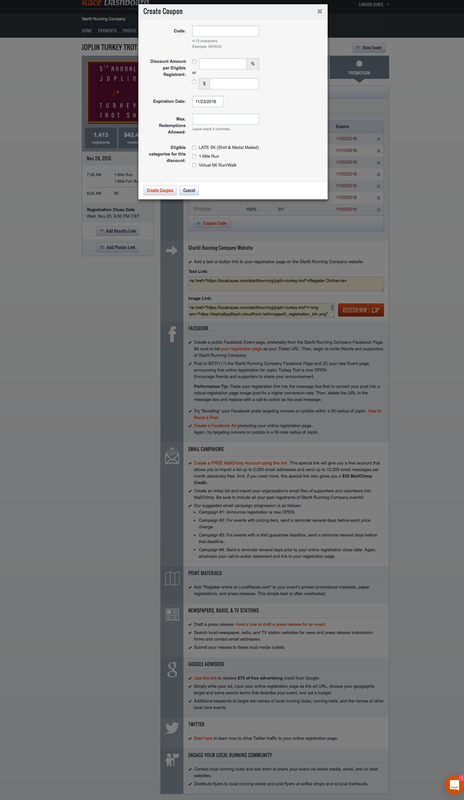 Create and install a Facebook Pixel ID to track your Cost Per Registration for each of your ad campaigns. You can then A/B test ad messaging, demographic targets, and interest targets to drive down your registrant acquisition costs. Create per-event coupons or per-organization coupons to offer a discount code for all your events. Tutorials included for email marketing, press releases, Facebook, Google Adwords, Twitter, and more. 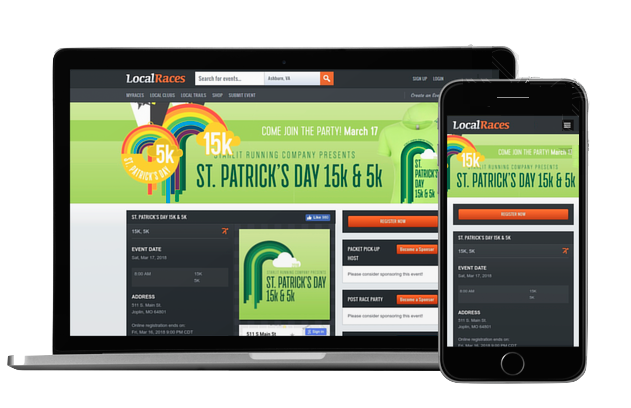 Sponsor logos can be displayed on your event page. 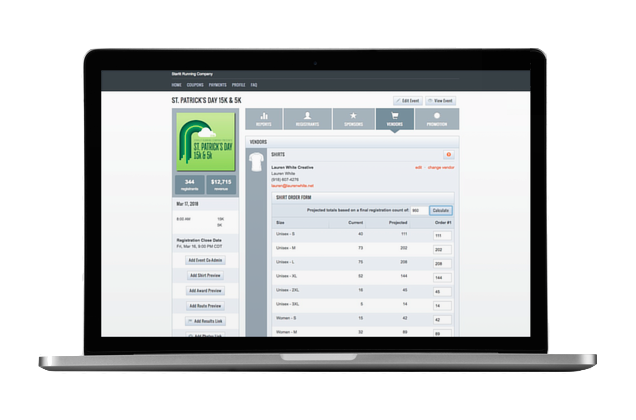 Once you establish sponsorship types, descriptions, and pricing, you will have a link to share with prospective sponsors for quick and easy sponsorship purchasing and logo uploading. 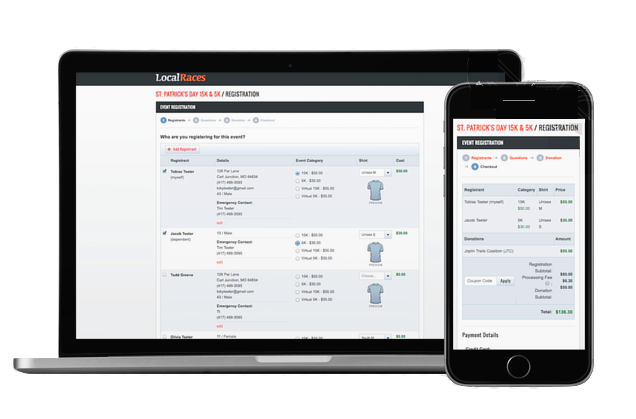 Manage your sponsors all in one place. 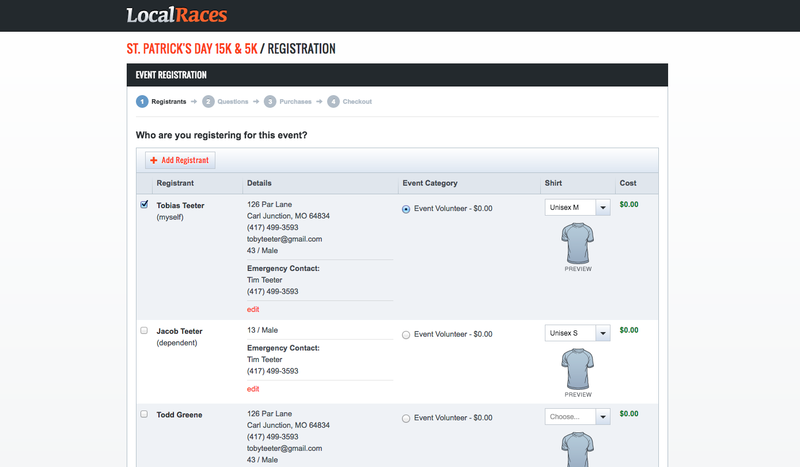 View, edit, or add sponsors from your Race Dashboard. You can also view, download, or edit logo files. 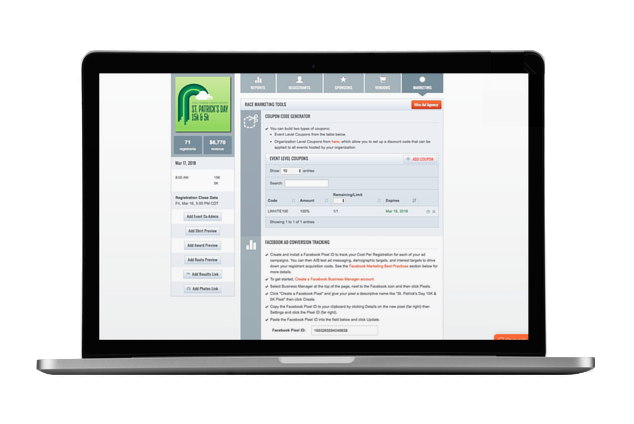 Create volunteer opportunities by type to allow volunteers to enroll and sign your event waiver. 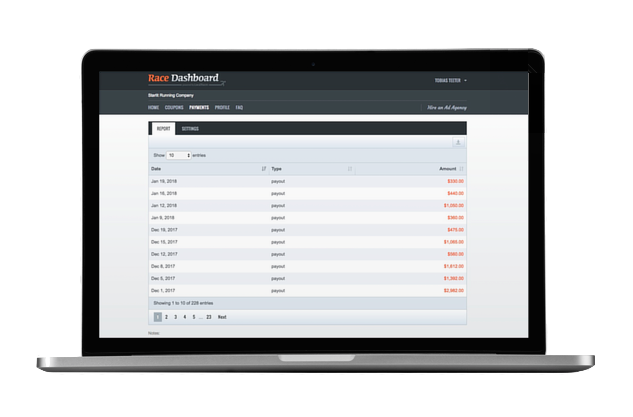 Manage, edit, or even manually add more volunteers all in one place. 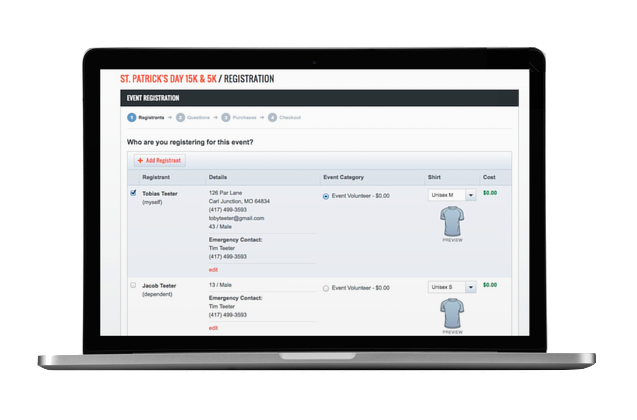 Manage race vendors all in one place, including shirt-printing, awards, chip-timing, and photography. 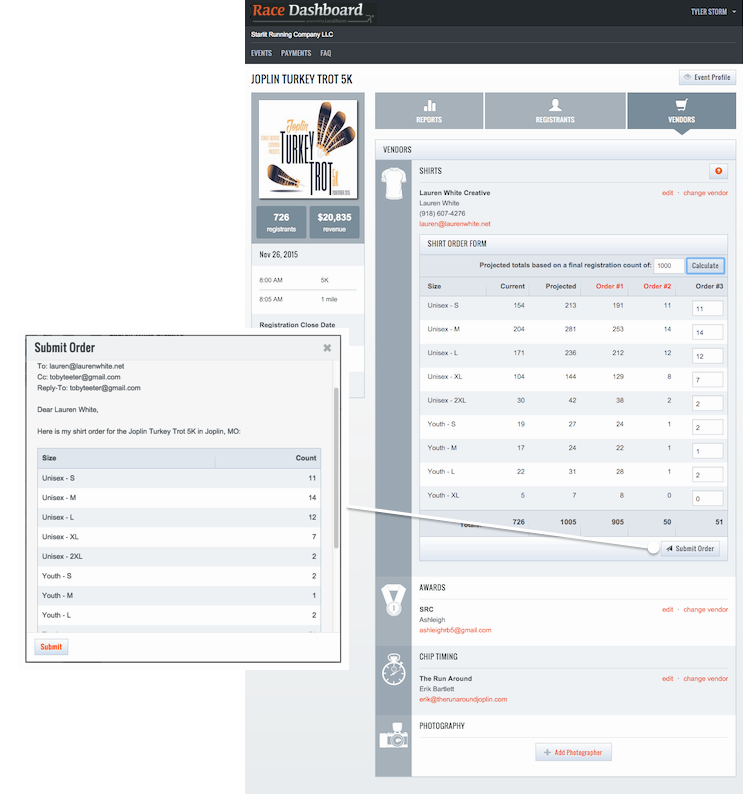 The projected shirt-count calculator makes shirt orders easy and accurate. 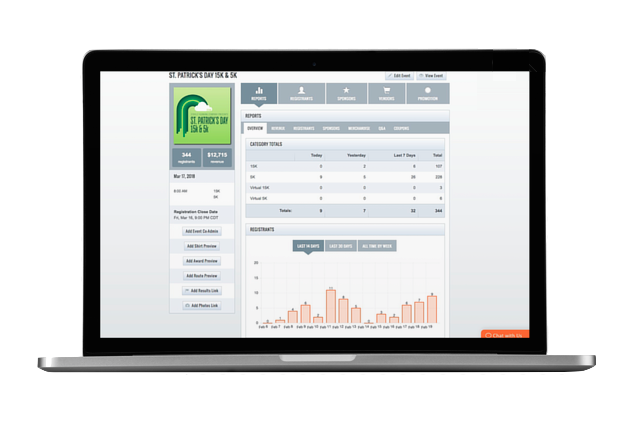 Collect data insights resulting in better decisions, including daily reports, graphs, and demographic data. Revenue reporting breaks out online registrations, offline registrations, merchandise, donations, and sponsorship revenues. 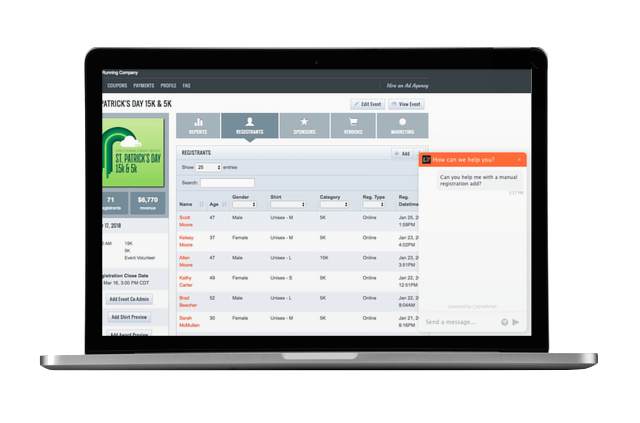 Say goodbye to “Support Tickets” and say hello to Scott, your dedicated account manager. His expertise is available to you via live chat and email.